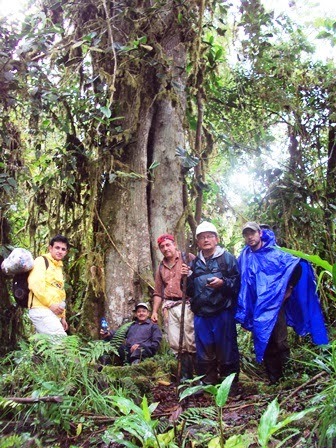 This is a summarised account of the 2012 expedition into the Llanganatis region of Ecuador, one of the world’s most inhospitable jungle regions that led to the re-discovery of an ancient megalithic structure. We should say that not only has a large structure been found but a significant quantity of archaeological pieces, mostly in the form of stone tools. This article intends to be a record of how this all came about and exactly who the men involved were. 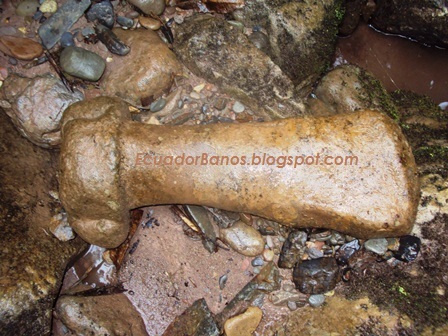 We would firstly like to thank Fernando Villacreses, for providing us with his interesting photographs and his own account of the expedition; in fact this article is intended to be little more than a translation and summary of his existing written account available online in Spanish at his Blog which depicts many additional images http://ecuadorbanos.blogspot.com/. We would also like to thank Manuel Vieira for taking the time to upload the excellent video report that we have linked to in this article, as well as his friendly communications with us. This article will help English speakers understand what exactly is happening in the video. In April 2012 this expedition was arranged to enter the Llanganatis in search of a mysterious structure that the group had become aware of. The source for this awareness was a twelve year old photograph that exists in the local government offices of the town of Banos De Agua Santa. Some unknown person had discovered a large megalithic wall, but this find had then been lost again. The logistics of the exploration were arranged by Manuel Vieira, an official from the Ministry for Indigenous Peoples. It was only possible once they had located a knowledgeable guide from the local area, one willing to take them to a place known only to very few people in that region and kept secret for its protection. 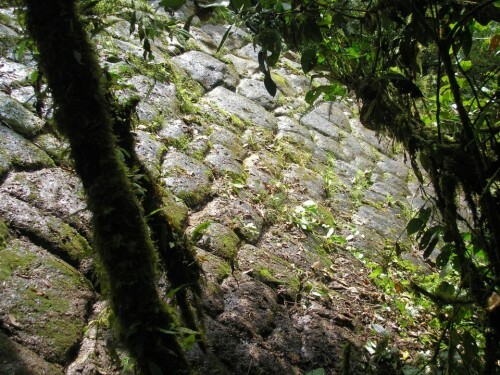 The first attempt to reach the megalithic wall seen in the photograph was on Friday the 27th of April 2012. There was a genuine attempt made by members of the team to encourage the Ministry of Patrimony to send along archaeologists. This offer was sadly rejected for unclear reasons, as it is normally the responsibility of that Ministry to investigate ancient sites. The hike requires an early start, by 6.30 the group were on route to meeting at the edge of the jungle, passing through Rio Verde, then El Topo onwards to the last vestiges of humanity located in small villages at the edge of the jungle such as the tiny Colonia Azuay. From there it was kit on time, most importantly good gum boots due to the fact swamps are part of the path into that area of jungle. The guide took lead and the rest did their best to follow along horrendously muddy pathways. It should not understated how swampy and perilous these paths are, with mud deep enough to sink your legs completely into with one wrong step. For Manuel Vieira this was even more difficult as he was bravely filming the entire journey whilst trying to keep his footing. Some areas of the path were merely a foot wide with perilous drops to claim the life of any careless walker. Three hours of walking completed a well-deserved break was taken before the guide ushered them to continue less they not have time to complete the journey in daylight. The going was tough with thick vegetation having to be cleared with a machete so as to open a pathway ahead. At times the path simply ended and new routes had to be found. The only joy of the walk was the scenery, with entrancing plant life and a throng of animal life to be witnessed. A four metre drop that had to be scaled made the moment of tranquillity fade away, replaced by the pain of splinters from the few logs and sticks that offered support for the climb downwards. A further 45 minutes walking brought the group to a river, and a hike of a kilometre upstream brought them suddenly to an area showing important archaeology. 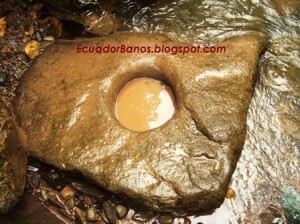 A number of large stones with circular holes cut through their middles. Possibly these were for washing gold, but perhaps for a more mundane use. Whatever the use the fact that human hands had shaped them made them an important find at this remote location. Despite this initial find a new problem arose, the guide was now lost, he had taken a wrong turn. Manuel Chauvin called out to the jungle spirits for help in finding their correct path. There are many legends that the mountains themselves can move in the Llanganatis so as to confuse would be adventurers. Though the wall did not immediately reveal itself a short walk further brought the group to a new archaeological find, a strange stone object appearing to be a large hammer head. Shortly after this discovery more of these objects were found to be scattered on the ground. It felt certain that the great structure must be nearby, indicated by the artefacts, and the group were keen to press ahead. Unfortunately time was against them, the guide informed the group they must turn back or face being lost in the jungle at night. The group started back, but it came to a point where a tent could be pitched and some decided to camp for the night whilst other would try to make it back to the vehicles. This second group became lost in the darkness later and were lucky to survive, it was the luck of the gods that they stumbled upon an old ranch and collapsed down inside to sleep alongside the existing inhabitants, mostly bats but plenty of mosquitoes too. In the morning they finally escaped the jungle. The team members that camped had again attempted for the megalithic wall in the morning, this had again failed to reach the objective. There had been more discoveries however, more of the stone hammers had been seen of varying types and sizes, also stone channels for water and strangely shaped stone objects. At one point in the search Manuel Vieira had almost paid with his life having slipped on a river stone and hit his head hard, but fortunately these group members also managed to safely find their way out of the jungle. One week later the friends had arranged a new attempt at locating the main site, emboldened by having come so close and finding so much archaeological debris. This time different team members of the team had come and other remained at home. A new guide with more knowledge of the area led them, and at the crucial moment, just after the four metre drop, he took a different path to the previous attempt. 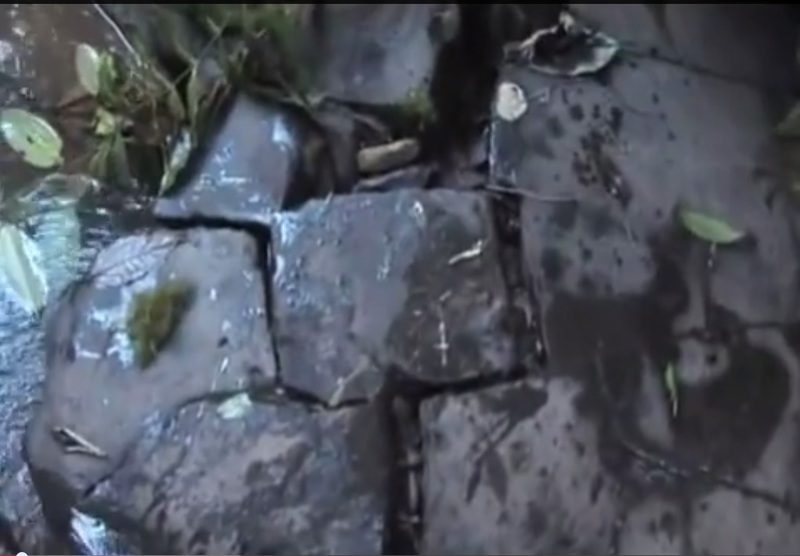 After a period of walking the group came upon a small river tributary where the observed a number of stone blocks on the ground that were perfectly interlocked. This was absolutely confirmation they were close to the destination as the style of the stonework was identical to that they had seen in the initial photograph of the site. Not far ahead was a waterfall and at last before their eyes was the huge megalithic wall and success for their perilous expeditions. All members of the team were left breathless and astonished, wondering at how such massive blocks were sourced and brought to this difficult place over paths difficult to walk with just a few possessions on your back. Time runs quickly when you are enjoying yourself, and in the excitement of the moment the available hours for exploration came to an end and the astonished adventurers made their way back to the edge of the mysterious Llanganatis. The next priority was to report the discovery and this was promptly done, with details given to the relevant Ministries in Quito and the local government in Banos De Ague Santa. It is the opinion of all those involved with this discovery and the ongoing research, that this site if of enormous importance to Ecuador and the world, it is now up to the government to carry out the will of the people in preserving this monument of national heritage. Visit the next article in this series or visit previous article. What a great discovery! I look forward to the updates on this! Thanks for sharing your knowledge of this exciting discovery with us. Well done. I drop a leave a response each time I like a article on a blog or if I have something to contribute to the discussion. at. And on this post The Discovery of the Llanganatis Lost City – First Two Expeditions | Mysteries of Ancient Civilizations. I was excited enough to post a commenta response 🙂 I do have a couple of questions for you if you don’t mind.